Sunny Florida in a jar! Peel oranges with a vegetable peeler. Remove the white parts of the oranges and discard. Chop the orange segments, being sure to remove any seeds and add to a large pot. Zest lemons and add to pot. Juice lemons and add their juice to the pot. Add sugar and orange juice. Bring orange mixture to a boil and then reduce to a simmer. Add pectin and water to a separate saucepan and bring to a boil. Boil until thickened, then add to orange mixture. Simmer oranges until they have reduced, are darker in color, and have thickened. Test for doneness by dropping some of the marmalade on a frozen plate and letting it sit for 30 seconds. Tilt the plate, if it still runs, it's not done. If it's soft-set, then it's done. 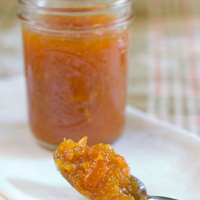 Remove marmalade from heat and start canning.